You'll be £9.00 closer to your next £10.00 credit when you purchase The Sinking of RMS Tayleur. What's this? The wrecking of the RMS Tayleur made headlines nearly 60 years before the Titanic. Both were run by the White Star Line, both were heralded as the most splendid ships of their time – and both sank in tragic circumstances on their maiden voyages. Captain John Noble, record breaking hero of the Gold Rush era. Ship surgeon Robert Hannay Cunningham and his young family, on their way to a new life among the prospectors of Tent City. Samuel Carby, ex-convict, returning to the gold fields with his new wife – and a fortune sewn into her corsets. But the ship's revolutionary iron hull prevented its compasses from working. Lost in the Irish Sea, a storm swept the Tayleur and the 650 people aboard towards a cliff, studded with rocks 'black as death'. What happened next shocked the world. As featured in the Daily Mail, Yorkshire Post, Manchester Evening News, Hereford Times, Liverpool Echo, The Press & Journal, Dundee Courier, Fife Herald, Skerries News, Discover Your History, Your Family Tree, the Warrington Guardian and on BBC Radio Manchester, BBC Radio Merseyside, RTE Radio, Radio Warrington, Kingdom FM. This book is a nugget to have at home to discover the maritime world of the 19th century unexplored. Complete with a comprehensive bibliography, a glossary of nautical terms and a precise list of passengers, the author gives all the keys to the history of the shipwreck while combining the technique of the ships and the human side of this tragedy. Readers to understand this maritime disaster. As featured on Epaves De Paquebots. Gill said that researching this book made her cry, I wasn't far from it myself. Hoffs has recounted this awful tragedy with such description and dedicated research that you can almost imagine yourself on the deck of this unfortunate vessel. Not only has Hoffs successfully retold the events of that fateful voyage but she has also given the reader an insight into sea travel at the time, with detailed descriptions of life on board. An excellent read. A very interesting book ... It’s surprising how little known the ship is really, given the parallels with the Titanic. ... The Tayleur may lack the glamour of the Titanic, but it is a compelling and awful story in its own right. ... [Hoffs] has balanced the big story of the ship’s disastrous voyage with the stories of individuals on board and the details of life on-board. Some fascinating lives emerge. ... The social details Hoffs weaves into her book are sobering and enlightening. I found aspects of life on the ship such as the rules the passengers were expected to obey and the rations they received especially interesting. Other things – women’s clothing, for example – took on an unexpectedly deadly cast as I read on. I also enjoyed the use of good sizeable chunks of primary sources, both heading up the chapters and within them. They effectively set the scene, add detail, and give that firsthand insight that is invaluable. The eyewitness accounts of the chaos as the ship sank are heartbreaking: ‘And now began a scene of the most frightful horror’. The story of RMS Tayleur is fascinating. ... The Sinking of RMS Tayleur gives a good insight into the tragedy itself as well as the wider social background of the period. Despite its terrible subject matter, I enjoyed the book a great deal. Through exhaustive research and original sources, Hoffs has managed to dive back into history to Lambay Island, Ireland, and revive this forgotten chapter in history, bringing it vividly to life. And that's the mark of a great writer - to tell such a tale, and make the reader care. ... [T]his story will stay with me forever. Hoffs is strong on demonstrating why people were willing to take such risks in the hope of a better life ... [and] is able to vividly recreate the Tayleur’s journey, and the conditions which led to the ship running aground. Her account of the wreck itself [is] particularly affecting, as she balances acts of heroism and self-interest as passengers attempted to reach the safety of shore. ... Hoffs is able to trace many of the survivors, and writes affectingly about the way the disaster coloured the rest of their lives. ... The sinking of RMS Tayleur is an often-forgotten incident, bought vividly to life by Hoffs’ research. Sadly, there are questions which probably can’t be answered now, but this is as thorough an account as could be hoped for, mixing empathy for the participants with an eye of ambiguities and evasions in the official account. Hoffs doesn’t make grand conclusions, or seek to make the wreck into a microcosm of its time, or salutary story, but focuses on the impact of the disaster on the individuals involved, to great effect. As seen in The Press & Journal. On the 160th anniversary of the disaster, Gill Hoffs’ book reveals new theories behind the tragedy and tells the stories of the passengers and crew on the ill-fated vessel – it makes for fascinating reading. Thursday night, I began reading Gill Hoffs' historical recounting of the sinking of an opulently appointed passenger ship, The RMS Tayleur, the finest of its line. This ship sank decades before the Titanic struck its iceberg. I finished the book last night. Hoffs writes so well that the victims' stories jump from the page, and her description of the wreck itself and the passengers' and crews' terrifying hours afterward is masterful. Her research is thorough and the story compelling. I highly recommend this book written by a fine writer and researcher who does her job. Excellent read. Professor J P Reese, Texas. ...a revelation to me ... an enthralling book ... incredible tale ... fascinating ... a remarkable story, a very interesting book. BOOK OF THE MONTH: Gill Hoffs reveals new theories behind the tragedy and tells the stories of the passengers and crew on the ill-fated vessel. A well-written and thoroughly researched account of this lesser-known tragedy. A little masterclass in how to hold a reader enthralled by a tale of long-ago tragedy at sea. I couldn’t stop reading. Gill Hoffs brings the story of the Tayleur vividly to life, and while the diligence of her research is evident, she succeeds in making the reading experience seamless. For an insight into life and death aboard a Victorian ship, this is highly recommended. Hoffs' telling of the sad story of RMS Tayleur is energetic and insightful. The author is at her best when she is painting vignettes of the people whose lives were effected by the mighty ship and its sinking. ... the book is well worth reading. [A] gripping new book, The Sinking Of RMS Tayleur by Gill Hoffs, vividly tells the story of the Tayleur’s demise and reveals a compelling theory behind what caused this supposedly ‘perfect’ ship to sink. A vivid and frightening elegy. A first class voyage of discovery...[and] skilful post-mortem of Victorian sea-going values. A fascinating, well researched account...Highly recommended. Hoffs' enthusiasm for the subject and extensive research makes for an absolutely fascinating read scattered with inserts from historical reports and newspaper articles. The book starts by painting a picture of the social and economic problems in 19th century Ireland with detailed, gritty descriptions of children starving in the famine and the first crowds sent on ships to Australia in search of new life. The story then describes and offers theories for the devastating wrecking of RMS Tayleur, the 'Victorian Titanic'. A truly wonderful social history of a tragic and unexplained shipping disaster. Five Stars. A dramatic and gripping account. ... a fascinating story of a shipping disaster. "a wonderful writer ... Gill has brought the events that led up to the wreck, and the disaster itself, to life in her book. It’s a harrowing story, and written in a way that draws you on to the deck, standing shoulder to shoulder with the crew and 650 passengers as they desperately throw themselves into the sea, and onto the rocks, to escape a sinking ship. The true, human stories associated with the wreckage are heartwrenching, and the technical detail of every aspect of the ship, of what should have been the greatest ship of the Victorian age, and everything that went wrong which could have been avoided, is gripping. This book will draw you into a period of time, and an event, that is so far from our own – but will feel current, and real, and you cannot help but be different after you’ve read it." An intriguing slice of maritime history, which was a media sensation in its day, but has been eclipsed by other more famous disasters since. Enlightening new book ... the author focuses on the heartrending individual stories of passengers and crew, including some of the heroes of the disaster. ... multi-layered and fascinating story. The entire story told by Gill Hoffs is a detailed account of the personal stories of the passengers, crew and victims of the Tayleur Tragedy and is well worth reading. There is substantial new information and analysis which adds colour and interest to the terrible story. In January 1854, the Tayleur, run by the White Star Line, sailed out of Liverpool bound for Australia...Unfortunately, the revolutionary iron hull prevented the ship's compass from working as it crossed the Irish Sea and a storm swept the Tayleur and 650 passengers towards an unyielding rocky cliff. Less than half survived, and their accounts of the terror they lived through make compulsive reading. Gill Hoffs gives a very human – and dramatic- account of the loss of the Tayleur in the Irish Sea 160 years ago. Eloquently stitched together story. ... By using recorded accounts from survivors, newspaper clippings and even atmospheric black and white drawings, the incident is painfully evoked in all its chaotic complexity. ... This is not simply a chronicle of anonymous tragedy after tragedy – we know the passengers’ names, their situations, their relationships, where they lived and who they were in life. There is a strong sense of wanting to reach a hand through the pages and save those we see slipping away. It hurts because it is so vivid. We feel the cold and horror of desperate loss after desperate loss. ... I learnt so much from Hoffs’ sensitive and well-written account; it helps that it is rich with detail and feeling. We all might hope that we are never tested to the extent that the passengers of RMS Tayleur were tested. ... infused through Hoffs’ forensically detailed account was that the ties of family seem to make heroes of ordinary people. It was extraordinarily powerful ... The Sinking of RMS Tayleur is not a book I will lend to anyone. You must buy your own." Not just a compelling tale of a tragedy, but also an engrossing piece of social history. greatly enjoyed it - found it hard to put down. It gives weight to the saying 'Worse things happen at sea." Very enjoyable, but of course harrowing, to read - I have read about many disasters as this used to be part of my work as a consultant engineer, but this was still difficult in places. ... a very interesting insight into life and mentality of the people in the 1850s. A fantastic read. I found it historically interesting, very harrowing and sad in parts and also quite uplifting in some of the people's bravery and self sacrifice. I also found the crew and passenger list very useful. 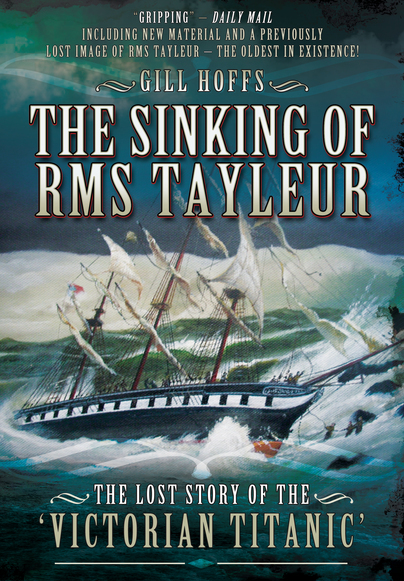 Gill Hoffs' new book, The Sinking of the RMS Tayleur, grabbed me out of bed last night like a storm. There are so many questions surrounding the sinking and the individual fates of the emigrants aboard the ship--tragedies and triumphs so compellingly and respectfully portrayed by the author. Gill Hoffs sets the scene generously with striking, often unsettling detail; and her descriptions of mid-nineteenth-century ship travel and the surrounding social conditions are convincingly well researched. These things alone would have kept me reading, but the jewels of this book are certainly the voices. The author resurrects the passengers of the RMS Tayleur and their stories in an approachable style that also serves as a suiting memorial to this tragedy. From the sailing and sinking to the ensuing inquest, each moment comes alive through dozens of eye-witness accounts. Hoffs has compliled a thorough and thoroughly engaging multi-voiced work. And I'm so glad Hoffs made the decision to include so much of the survivors' own words, as well as those from at least one passenger who didn't survive. Hoffs gives the reader not only a feel for the times but also a feel for how the people spoke in mid-nineteenth-century England. Hoffs also posits a possible contributing factor to the tragedy, an intriguing hypothesis that I won't divulge. I'm sure you'll want to read it for yourself. If you are keen on the history of ship travel--and even if you aren't; I'm not, except for my occasional AIDA cruise, and I loved this book--you'll love this one too.